One of my favorite anime. It's very educative and it's fun to watch. It's very 2D* and chibi. It teachs you a lot of thing that normaly you wouldn't notice. It's something you can rewatch over and over without getting bore. I suggest to watch the chinese version (it's the version i watched). A great childhood anime and it is still popular in Japan. The story is simple yet heartwarming and funny. 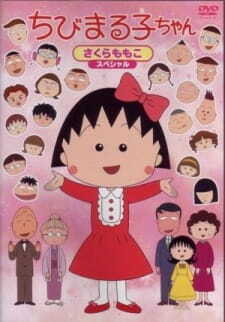 Almost all Japanese of all generations know this anime (and even has a museum created too).Who does not know Maruko and her unique family? WHo does not know the rich Hanawa? It provides a comical sketch of everyday life of Japanese people (back then). This anime also teaches us about Japanese culture indirectly. My favorite character? Hard to decide but probably ojiisan. Along with doraemon and sazae-san, this anime is truly anime of all generation. This is my childhood favorite anime which I had seen every night on TV in my country. This anime is long enough to watch and watch again without being bored. The sound is good with simple Japanese communication, so it's really good for someone who is learning Japanese. The OP and ED songs is really good. The art is the best of 1990s' anime. The story is really interesting because of traditional and modern Japan through this anime. And this is not just entertainment, also educational anime. Children should watch this anime once time to get fun and life experience. Sure before writing this review, I just watched this anime again on Internet, that brings back alot of my childhood memories.